So I got a wicked groovy present this week. Well, two, actually, but Top Management says I’m not allowed to talk about one of ‘em. How gorgeous is that? It is not only one of my favorite pieces of art ever, it is probably my single-favorite Superman shot of all-time. The juxtaposition of the photorealistic background with the cartoony, European-with-just-a-hint-of-Japanese Superman figure is incredibly powerful. 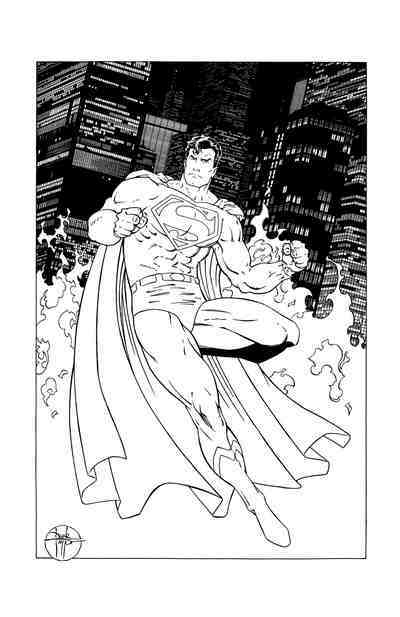 Not to mention that Superman just plain looks freakin’ cool. This piece was done by Dave Taylor about a dozen years ago and is, in fact, the first time I ever encountered his artwork; I was so stunned that I hired him on the spot. We went on to do an awful lot of work together, much of which I'm as proud of as anything I've ever worked on, and I’m delighted to be working with him again after a gap of about eight years. And apparently the poor sod’s pleased enough to be working with me that he felt compelled to give me a pretty. I suspect it’s my smooth moves on the dance floor. Gets ‘em every time. Vinny has been playing the Superman game recently, and I said to him, "I thought you said this game sucked?" and he said, "It does, but you get to be Superman." I think that sums a lot of things up.